Last week saw yet more congestion for air freight, along with more sky-high air rates around the globe. US airports are experiencing significant congestion in the run-up to Christmas, affecting both domestic and international freight movements. In Europe, air cargo hit capacity two weeks ago and hasn’t yet pulled back. Heathrow, in particular, is experiencing severe backlogs. And now, bad weather has hit some European airports, including Zurich, Schiphol, and Frankfurt. Airlines aren’t expecting congestion to abate and prices to return to normal until 15 January…just in time to start heating up again, with shipments vying to get out of port before the Chinese New Year shutdown. 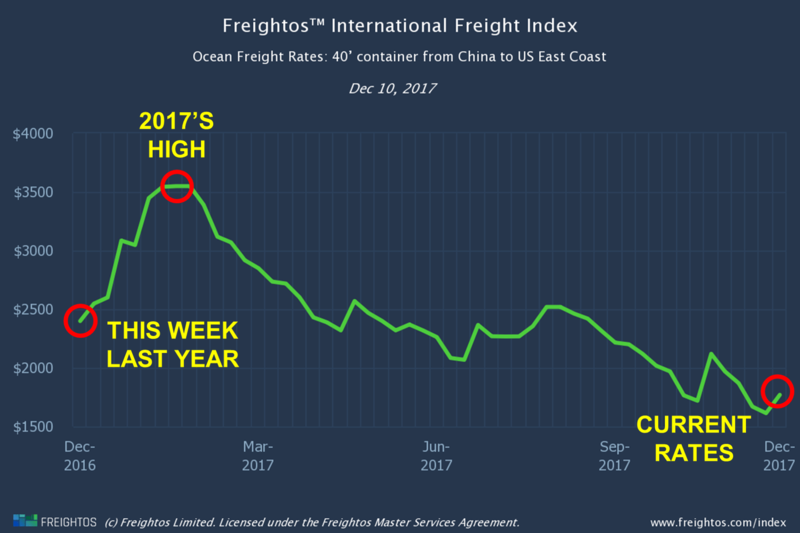 Air freight congestion appears to have encouraged frustrated shippers to switch mode to sea, where there are no capacity issues to speak of. “Air freight hit capacity late last month and with bad weather in Northern Europe, the situation is getting worse. I expect this auction-like market behaviour to continue. I’ve seen forwarders paying more than 18€ per kg (over $20/kg) for Europe to South America, and even one offer around 30€ per kg. These prices aren’t realistic – or at least they shouldn’t be! On the ocean side, December 1 transpacific GRIs came through, albeit weakly. China-US East Coast recovered most with a 10% week on week growth. That said, rates are still well behind rates this time last year, and even further behind Q1 levels. And the same goes for China-US West Coast rates, too. Further GRIs have been announced for January 1, and, to date, a number of carriers have also announced an increase for December 15. Expect any increases to be similarly modest. China-US West Coast rates rose slightly (5%), but are still 26% behind last year’s rates. China-US East Coast rates also rose (10%), but are still 25% behind last year’s rates. China-Europe rates have been relatively stable recently. In the process, they are catching up on rates this time last year, from being 25% behind two weeks ago to only being 19% behind last week. Europe-US East Coast rates dropped again for the fourth straight week, lane, and are now a full 30% lower than last year’s rates and slightly less than half this year’s high ($3,549 in W5 and W6).